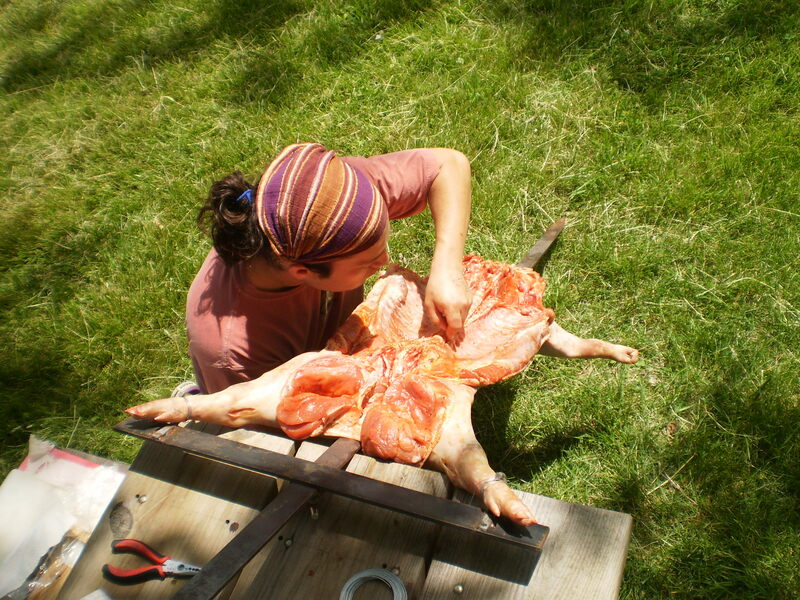 Mariano preparing the “lechon al asador,” Argentine-style pig roast at Peifer’s Orchards in Yellow Springs, Ohio (at right). – Traditional Argentine hardwood fire roasted local pork, lamb, and goat meats as well as whole chickens and “chori-panes”—Argentine sausage sandwiches with “chimichurri” sauce, as well as locally grown grilled vegetables. – La Pampa Grill is a mobile food business that operates in and around Yellow Springs, Ohio, and Private Chef services for parties and special events. See sample menus here. – La Pampa Grill sources all of its meats from local, family run farms in southwest Ohio including Anderson Farm, New Liberty Farm, TS Farm, among others. 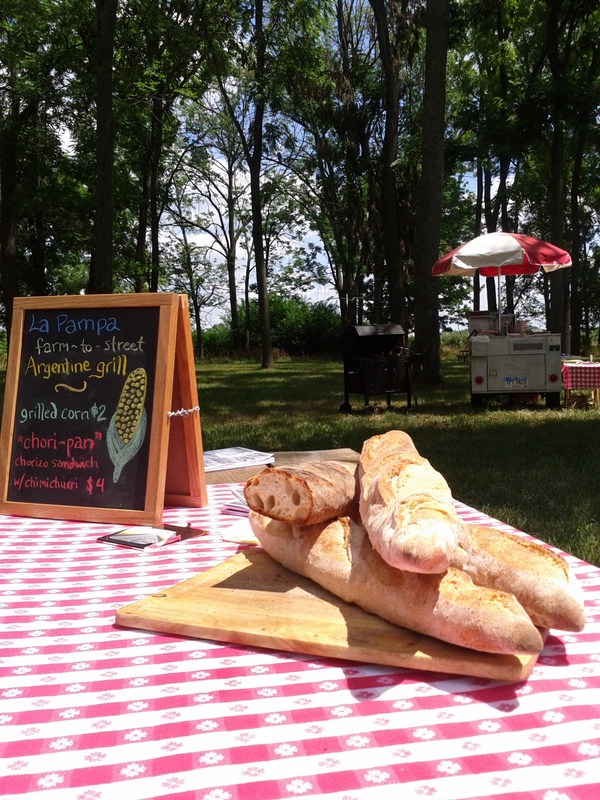 In addition, La Pampa sources produce from area Farmers Markets, and local, artisanal breads. We support local farms to engage in and help develop environmentally and culturally sustainable practices, a thriving local economy; and offer the highest quality, fresh foods cooked in a simple, slow, traditional style. Check our website’s recent posts and facebook page for current locations and events. My husband Edd and I were thrilled to have La Pampa cater our wedding celebration in July of 2012. The entire process from planning to implementation was easy and very thorough – La Pampa thought of everything. 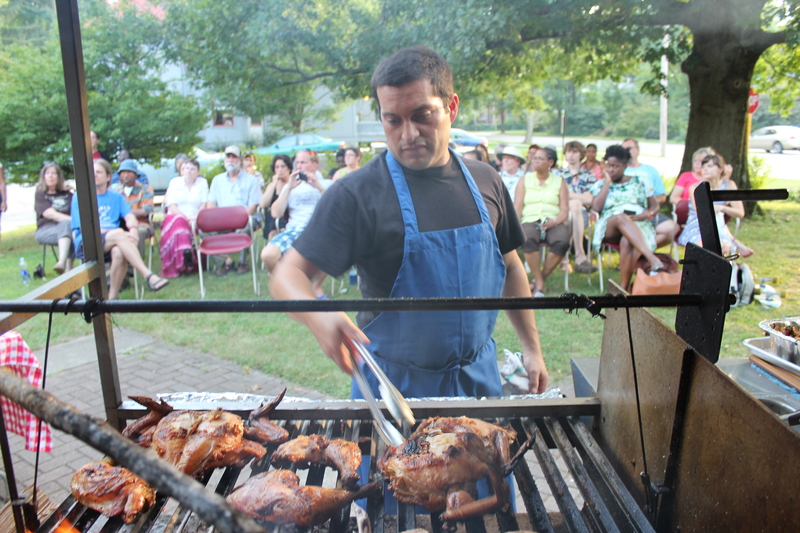 For about 80 people, Mariano cooked two pigs, a few chickens, some tofu and grilled veggies, all of which were big hits with our guests! They really enjoyed getting to learn about the Argentinian style of cooking the meat and the process he goes through to prepare and manage everything. A few friends also got details from Mariano on how to know when olive oil is really good! He was professional, personable and fun, which was a great fit for us. We are grateful for all that La Pampa did to make our celebration so special. Thank you Mariano and Luisa!